I had mentioned last week that I was surprised it took this long for Faith to get her own mini-series. 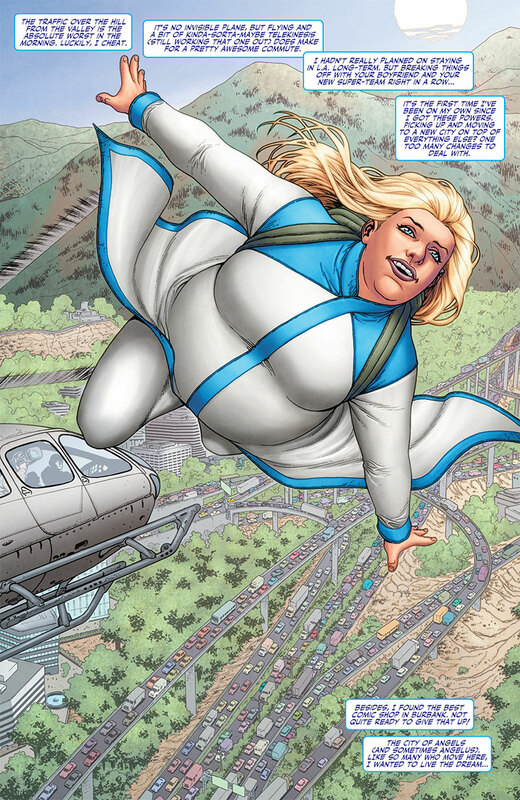 I have always thought Faith was one of the most unique characters in Valiant…in any comic, really. Faith was part of the “Renegades” in Harbinger, a small group of superheroes who fought back against Toyo Harada, a powerful psiot (Valiant’s term for someone with superpowers) who seems to be manipulating a lot of events. By the time this mini-series starts, the Renegades team has gone their separate ways, and Faith has moved to California where she works in her civilian identity for a celebrity gossip site. Faith tries to be a superhero here, but she seems to only find relatively tame crimes like dognapping. She reaches out to her old teammate @x, who has a lead on some psiots who have disappeared. Faith tries to track them down, and ends up confronting a strange man who tries to blow her up to cover up whoever is kidnapping psiots. FAITH reminded me of some of my favorite Marvel comics right now: MS MARVEL, SILK, PATSY WALKER, HELLCAT!, and SPIDER-WOMAN. Actually, it seems like the comic industry has created a whole new genre – quirky books with female leads. That seemed to start back with John Byrne’s SENSATIONAL SHE-HULK, which is one of my all-time favorite comics. That book was Deadpool long before Liefeld and Nicieza had created the character. Part of me wonders if it’s a little problematic that the only way a book can last with a female lead is if the book is a little quirky, but then again, I prefer HOWARD THE DUCK and ANT-MAN to most other comics these days too. Weird is what I want from my comics these days. I thought it was pretty funny that Faith was trying to have a traditional superhero civilian identity as a reporter, but in these days the only real place she could find a job was a celebrity gossip site. Times have definitely changed. I was also glad that they toned Faith down a little bit here. We still got some great pop culture references, but she seems capable of carrying on a conversation now without using them constantly. At times, it felt a little too much in her past appearance. Jody Houser seems to have found a perfect balance here. We get that Faith is a geek, but that is not all she is. The scene with Faith fighting dognappers kind of tells us everything we need to know about Faith. When she yelled “NO SHOOTING AT PUPPIES,” I actually laughed out loud. I also loved the quick little fantasy flashes where she’s thinking about all the cooler things she could be doing, like fighting aliens or robots or saving one of the many actors named Chris who plays a superhero in movies. Chip Zdarsky has been doing something similar in JUGHEAD, but his fantasy scenes always go on for too long and end up bogging down the story. They worked far better here. Another thing that I liked about this comic was the supporting cast. They were all done with a lot of detail and all felt real and unique. Her neighbors that seemed to be performing an improv version of MR AND MRS SMITH was another scene that made me laugh. I was sort of reminded of JESSICA JONE's neighbors from the Netflix series, though they were far less annoying here. I also liked the cameos from other Valiant characters like @x and Archer. I’ve been dying for the new Archer and Armstrong series for a while now, and his appearance here was real well done. To me, Valiant works best as a bigger universe, and I like when we’re reminded of the connections between the characters. The art was terrific too. Faith has always been a very unusual character in comics. She tends to be heavy, but Francis Portela still managed to make her look very beautiful. I thought that was a nice touch. There is no reason someone can’t still be beautiful even if they aren’t the “perfect shape.” Now if we can just get a few more characters who look like me…I think pretty much we’ve got Bouncing Boy, and that is about it. I also lived that Marguerite Sauvage drew the fantasy scenes. I have become a fan of her work, especially with the work she did on Swords of Sorrow and DC Bombsells last year. To be honest, her style blended so well with Francis Portela that I wouldn’t have realized it was a different artist if I didn’t check the credits. I will also say that as much as certain websites criticize the appearance of females in comics, I didn’t see a lot of them making a big deal about this book as a step in the right direction. I know it’s a drop in the bucket, but I still think it’s a pretty significant one. As you can tell from my review, when I was reading FAITH I was reminded of quite a few other comics out there. But don’t take that as me not liking this book or calling it derivative. Just the opposite! FAITH takes what other comics are doing and really makes it feel unique and fleshed out here. I enjoyed this issue so much, I actually would like to see it as an ongoing series. It seems like FAITH's and the creative team have a lot to offer here. Is it worth your $3.99? Yes! This was by far my favorite comic I read this week. It's a lot more balanced than past books starring Faith and I think this could be a solid ongoing series.